GERMANTOWN, Tenn. -- If you were at the Houston Classic Friday evening, you would not have imagined how Saturday would turn out. By the end of the first day of the Classic, the breeze eased up a bit and the temperatures seemed just about perfect. Then Saturday came and the team running the meet had to really scramble to figure out how to get the meet started, or for that matter, even get the meet in. Storms have been the norm around the area, and Saturday followed that pattern again. The field events had to wait about three or so hours to get going. Smart move by the meet staff since flooding pits and pooled water in the throwing rings just doesn't make for a great day. Luckily the pole vault events were held Friday night because it really would have been ugly to have those on Saturday. The 4x800 was the first run on Saturday and, if it was allowed, it could have been a canoe race. But it got going and with rain here and there for the first few events, the rain at least stayed partially away for the day. 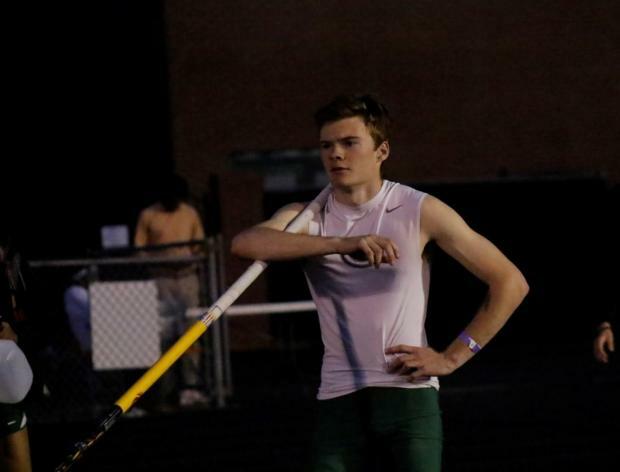 So anyways, watching the pole vault Friday night was a thrill. 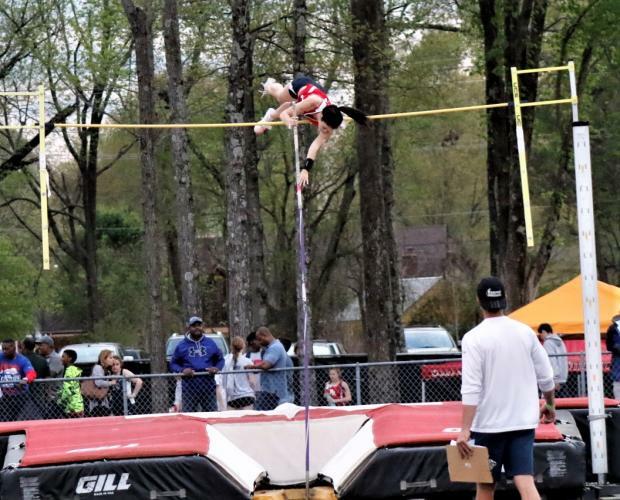 The girls vault was pretty much a preview of the state meet with Brentwood Academy's Alex Swindle getting an unusual second with an 11-foot jump. 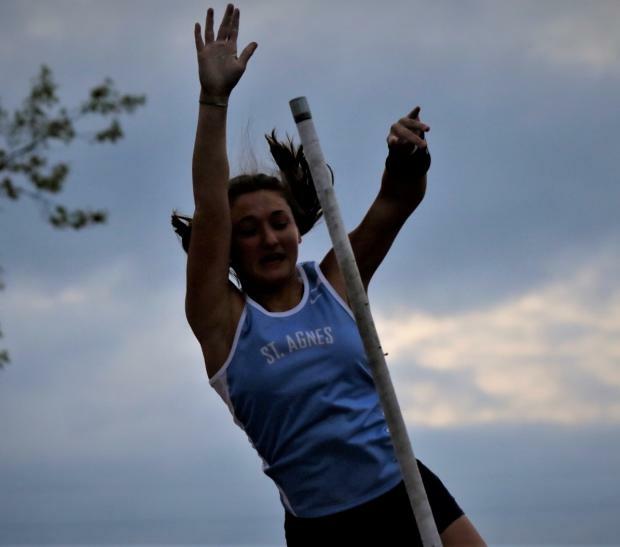 Kate Sander of St. Agnes had a pretty strong day on her home turf with a personal best vault of 11-8. Like a lot of events in track once you reach that elite level, it's hundredths of a second or simply just an inch or two that defines success. Kate is being successful with just that, inching her way up the standards each time she plants the pole. This will be an exciting event to watch that May Friday in Murfreesboro. The boys vault was just as exciting with a couple of Houston guys taking the top two with Nikhil Jogal vaulting 13-6 and Liam Jogal getting a 13-0. 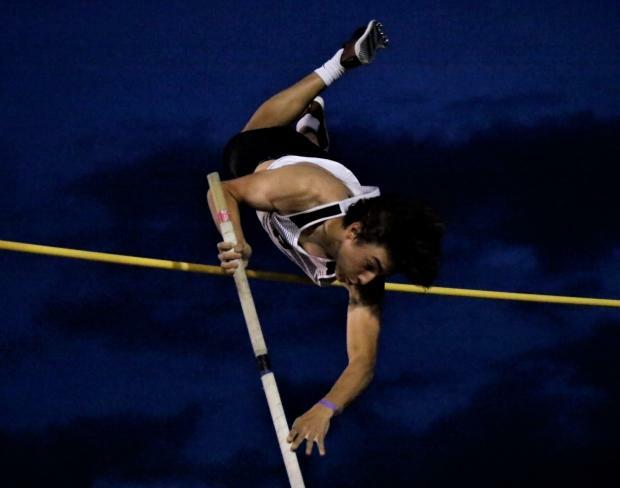 Brentwood Academy's Knox Perry was at 12-6 and Troy Taylor of Briarcrest rounded out the group of vaulters getting the 12-foot mark or better. This meet had several very strong performances in so many different events and the boys long jump was one of them. Christian Brothers Antonio Lay broke the meet record by three inches and Brentwood Academy's Camron Johnson tied the meet record at 23-3. That's two jumps at the meet over 23 feet! Pretty impressive! Antonio's jump just happens to be the top in the state so far this season and Camron's an inch and a half behind the previous state's best. So... two out of the top three long jumps in the state set at this meet, nicely done! The girls just as notable, with Cordova's Lauryn James and BA's Morgan Louderback were able to pound out two of the top 5 marks in the state as well. Morgan already had the 4th best in the state and she was able to add to that mark by the slightest of margins at this meet. Some impressive long jumpers for sure! In the sprint events, Kirstin Jones of Whitehaven kept up her winning ways by taking the 200M (25.01) and 100M (12.46) in this meet. 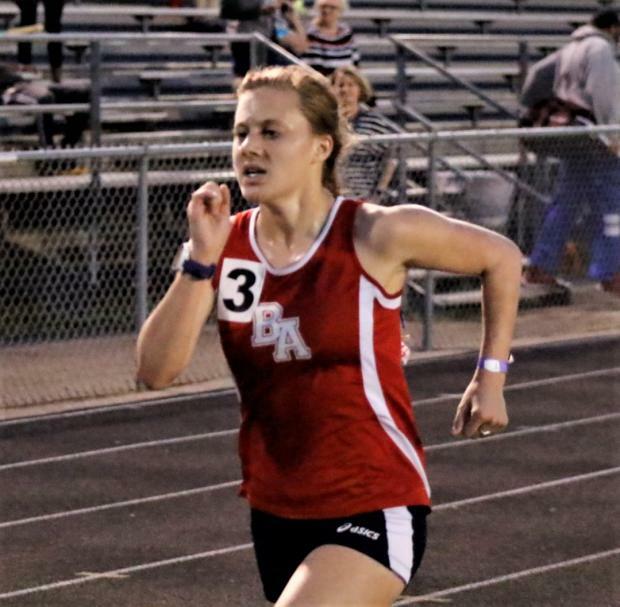 This junior sprinter is certainly gunning to get a spot higher in the State championships this year the way she's attacking the track this spring. With the rain and a bit of a chill in the air Saturday, I did not expect to see the 400M dash run the way it was. The top four guys in the meet ran under 50. Cordova's Travis Harvey was at 4th with a 49.94, Isaiah Weasby of Bartlett third fastest in 49.89 and Armond Poindexter of Memphis Central got runner up in 49.44. The winner was Collierville's Terry Towah with a PR of 49.27. These first guys ran in the first heat of a race that had ten heats total! And as thrilling as that race was, the girls 400 came out and did even better. Five girls broke the minute mark and just like the boys were all in the same heat! At 59.37 was Memphis Central's Madison Stokes, behind her was Faith Wilson of Southwind in 57.81, then Savanna Owens of Briarcrest leading the D2 girls across the state in 57.52. The runner up in this superbly fast race was Germantown's Mariah Smith and Breanna Miles of Southwind crossing the finish line first in 56.06. The 400 is a tough race for sure, but these athletes really made it look easy... well, until they practically all collapsed at the end! Now that's some speed there! Those that were watching the indoor season this year would undoubtedly recognize the top guys crossing the finish line in the 800. 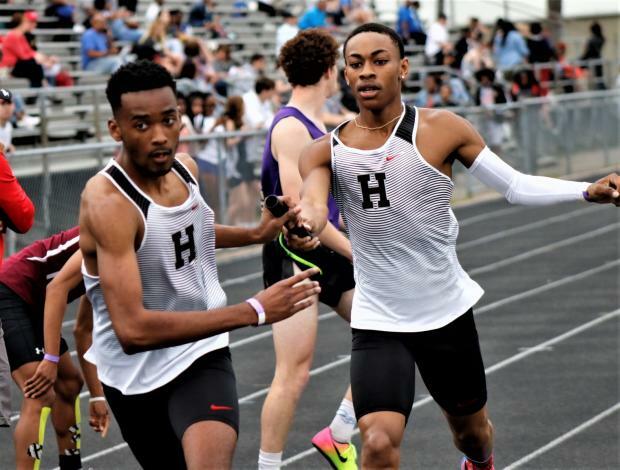 Yep, Colin and Keaton Jones of Houston were at it again at their home meet. This time Colin got a win with his 1:55.95 time and Keaton runner up in 1:57.02. And to help the team out a little more, their teammate, Charles Parker got the third spot in another sub 2-minute mark of 1:58.12. And wait, one more athlete ran across the line under 2 minutes and that was Keyorray Moore of Southwind. His time was 1:59.52. The girls 800 was a runaway with the D2 state champion from Briarcrest, Meghan Underwood, running in a state best 800 time of 2:16.39. This Arkansas commit ran the first lap in a blistering 1:03 and then settled in to coast through the finish and make a point that she will be one to deal with in Murfreesboro as well. 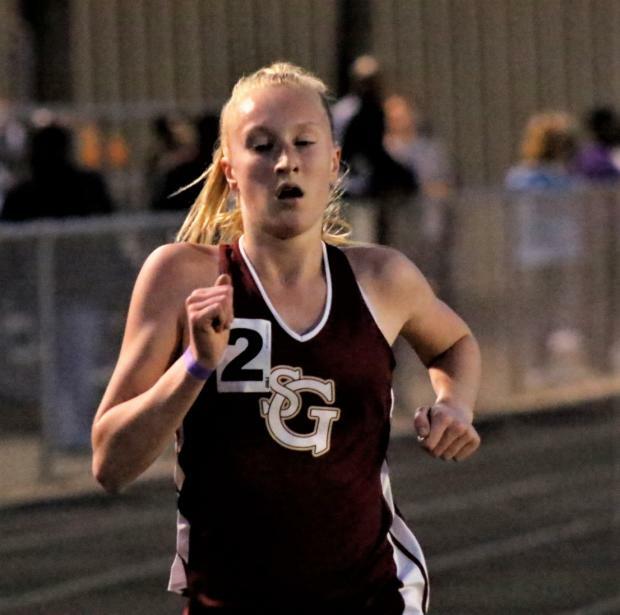 St. George's distance phenom, Allison Newman was the distance guru at this meet by winning the 1600 and 3200. 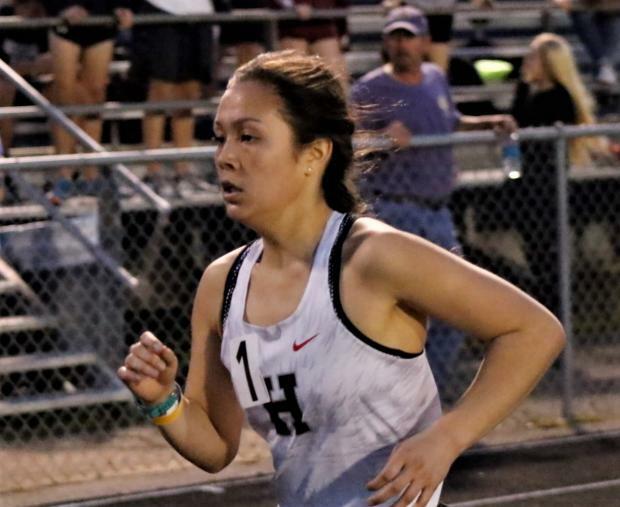 Both her times were close to her best times and at this meet, she needed to be fast to win with the likes of Felicity Bost and Lydia Tankersley (both of Houston) and BA's Kylie Wittman on her shoulder the whole time. 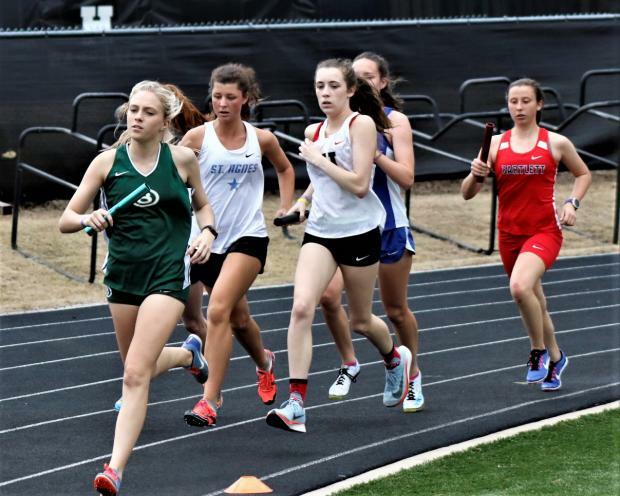 And speaking of Distance, the DMR was won in 13:20.10 by the Briarcrest team of Hannah Fisher, Rachel Reagan, Savanna Owens and Meghan Underwood that set the top mark in the state for this interesting relay that we see at these weekend meets! The boys DMR was a second away from claiming the same top spot with the 10:55.14 by the Houston High team. While on the relay topic, the girls Sprint Medley Relay team for Southwind was able to pretty much blow away the rest of the medley teams when they ran a meet record 1:46.92 time that easily set the top mark for the 800 SMR event. As a matter of fact, the top six teams running this event were all under the previous state best mark for the medley. The seventh girls team at this meet, from Briarcrest, ran a top ten state mark with 1:55.13. The SMR was held Friday evening along with the DMR and that seemed to make these a great opportunity to excel, and that they did! Finishing up the day, a long one at that, you'd expect things to be a little tired and less excitement. Well, that never happens with the 4x400. 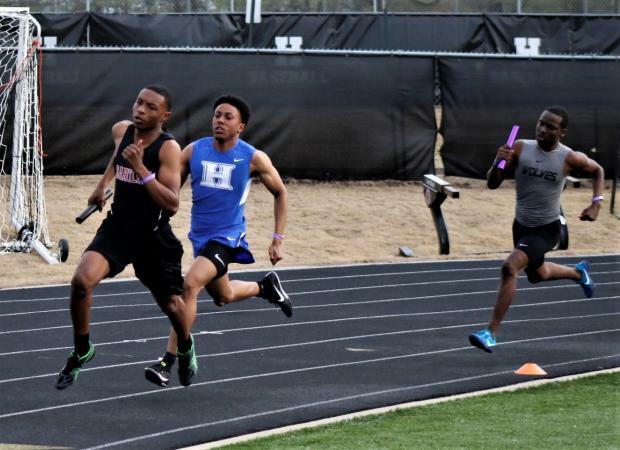 The boys 4x400 was won by Houston in 3:24.13 with a close race for second between Southwind (3:30.07) and Collierville (3:30.45). But just prior to the guys running, the girls put on a 4x400 show for sure. Southwind won in a meet record, a smash the heck out of the meet record, time of 3:56.01 and Whitehaven also broke the meet record with their second-place finish in 3:59.74. Both these times are now the top two times in the state for the event. Southwind by the way already held the top spot coming into this meet but shaved off a couple of seconds to make that even more impressive. In the team results, the girls had a very tight contest with Brentwood Academy taking the top spot with 89 points, Whitehaven in second with 87 and Memphis central the bronze with 86 points. Very close for these three powerhouses. If I were to guess, it is likely we'll see these school near the same spot in their respective state championships at the end of May. Might be interesting to see how Whitehaven and Memphis Central end up! The Brentwood Academy boys took charge at the meet and with 143 points did not make it easy for anyone to catch them. Memphis Central was second in 90 and Houston third in 87 points, making for a close battle for runner up at this meet. The BA boys and girls teams certainly had a nice ride home that evening and likely just made a loud statement that they are the ones to beat come May 25th in Murfreesboro. But before I close out this little recap, I'd like to point out something that we see at some of these bigger meets. It's the Marines. They bring out their pull up setup and there's almost always a line of athletes taking the challenge. It's fun, competitive and really great that these folks support our sport with the level of enthusiasm they always bring! My father was a marine that fought at Iwo Jima and was one of the few that returned. 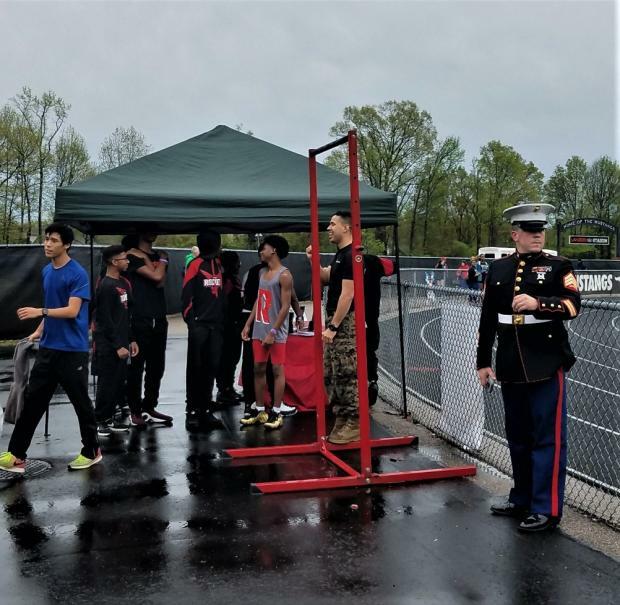 The Marines support our sport of Track and Field, by all means let us always support them too! So that is a quick recap of one of the biggest meets in the state by a high school and a do not miss meet if you are in the Memphis area. Always good competition here and really need to send a shout out to the Houston crew for working hard to get the meet in with all the rain. It was a scheduling nightmare and with mother nature leading the way, not something that is easy to win at! And guess what... on my drive home after the meet, it started raining. Go figure!